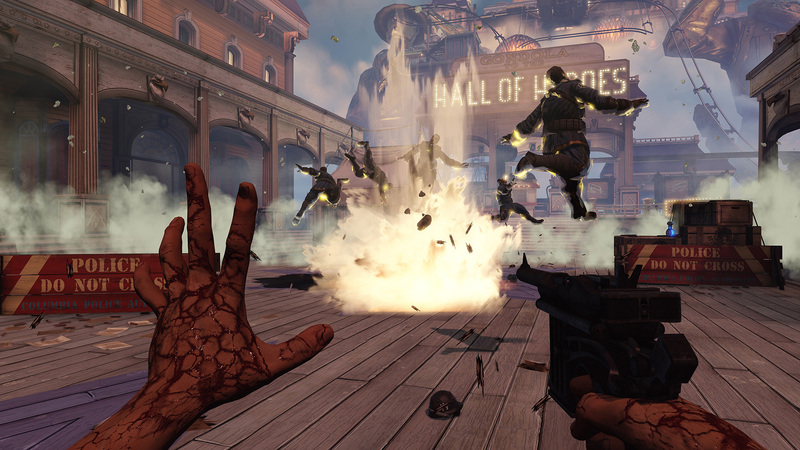 How Elizabeth ruined Bioshock Infinite for Francisco Dominguez. Right from the start, Columbia aims to dazzle. Players stroll through its lush avenues, showered in exquisite summertime light. Towns soaring high above impose the impossible vertical scale, dizzying elevation implied by fluffy fields of clouds. And that music: soft religious chants subside for orchestral string arrangements with a hint of Dvorak when you take your first steps into its streets. With its outrageous assortment of coordinated flourishes, Columbia is its own New World Symphony. But no wonder this lavish apparent utopia provides has any effect on the game’s protagonist. The wealth of sly details to observe, conversations to overhear and cute performances to watch are acknowledged by the player, who might occupy the same physical space as our protagonist, but not the same mindset. The cantankerous Booker DeWitt remains unmoved by the concerted efforts to intrigue and entrance. I guess he’s just not that into the Beach Boys. I am not so presumptuous as to demand characters whose feelings are tethered to my own. But when a stunning new world such as this unfolds for the first time, not just before me but before my virtual representative, can’t I expect some synchronicity? Why do our reactions and intentions to this world so rarely align? Of course, unlike me, Booker didn’t visit Columbia to marvel at its sights. He is a violent man. He’s committed atrocities he’d rather forget. Years of anguish, drink and gambling distance him from me. His past accommodates his indifferent response. In fact, it’s arguably designed to rationalize, even pathologize what has become the FPS protagonist’s range of interactions. This would be why his dialogue is so utilitarian and deductive, always targeted towards a goal. This would be why his distinctive verbs are so narrow: he eats, shoots and cleaves. Even pandas get more agency. Nothing suggests he’s given to pleasurable activities, only the compulsively satisfying. Fantastic. We’ve solved the ludonarrative conundrum. Now let’s make all our characters callous assholes and let’s never talk Greek again. Except it doesn’t work like that. The invisible, deeply ridiculous confines of player agency can work when these are either given or deprived of context. In Bulletstorm, I don’t mind that my every action is violent in intent and execution. In this world, at this moment, violence, and nothing else, surrounds me. But while the world of Bioshock Infinite might be based on systemic violence and oppression, it presents itself with a peaceful veneer, one your companion through Columbia can access so effortlessly. Elizabeth’s true superpower might not be the ability to reach and manipulate other worlds, but how firmly she is rooted in this one. Walls, to her, are a tangible reality to lean against, not a geometric barrier to be navigated. Pictures and posters are something to be playfully examined from various angles, not a texture to point your gun at for a while. Her inquisitive, naturalistic access to the physical world makes Columbia more of a real place, and exposes the pathetic limitations of Booker’s interactions from the second she hits Monument Beach. By the time you’ve recovered from your daring escape, Elizabeth has run off exploring. The descending sun tinges the sky, the clouds, the beach and everything on it with a gorgeous rusty hue. Sunbathers recline languidly on Hey, you see a young girl? Shut up, Booker. You trudge through the sand. Pulled towards the source of the light, jaunty music, the end of a short wooden pier. There Elizabeth dances, carefree, to a lilting jig Miss? Miss. Miiiiiiss. Shut up, Booker. The music and the dance continue, as do Booker’s ignored protests. Press F to get Elizabeth’s attention? But why interrupt? Just wait a moment lo – fine, Booker’s dialogue is looping. Are we there yet? Are we there yet? Okay, okay. I press F to extract her with a lie. No I don’t dance. Yes, let’s go to Paris. Elizabeth runs ahead, keen to get to Paris. But wait, there’s still incidental dialogue to hear, further interactions to trigger. I watch her lift an exercise ball and skim stones along the waves. Booker snorts, tells her to stop. Then I hijack his legs and he runs to find more for her to play with. Perhaps I shouldn’t find this so fascinating. Only, isn’t testing the physical capacity of your surroundings a fundamental function of play? But I can only access this mode of interaction vicariously, crudely. I can’t hand her a toy directly like I would a child. Things pass from her to me, rarely me to her. I drag her by that invisible leash and wait to see what she sniffs at. I’m limited, lacking the tools to share my enthusiasm or invoke it in others but I keep trying anyway. Twenty minutes later, we finally leave the beach. Narrative impetus tugs players in one direction, the area’s construction pulls in another. Any exploratory impulses must conflict with Booker’s witless hectoring. Do these mixed signals constitute bad design? After all, these vignettes exist to be witnessed. I wouldn’t search every barrel if I had not been trained to expect to find something inside, can’t that attitude apply to observational completionism? The player can grab the girl and leave, unimpeded, and that’s fine. But it’s the impatient enslavement to that ever-present liminal objective marker which is acknowledged. My way is ignored or contradicted by my avatar, even as he enables my behavior. Patricia Hernandez at Kotaku has voiced similar frustrations. You constantly collect money yet you can’t buy Elizabeth ice-cream. You find carousels but you cannot ride them. Theme park influence on game design has been acknowledged in many quarters, and is deliberately invoked here with rollercoaster rails and ethnic halls of horrors. Yet here is a theme park made of ride after ride with nonsensical restrictions on pleasurable interludes. I’m sorry, you’re too tall for candyfloss. This musical interlude is so unlike Booker’s usual behavior that I am tempted to consider his ability to provide a backing track as nothing beyond a setup to parade Elizabeth’s sympathies. But even if it means nothing, it says something. If art’s great pursuit is to uncover what it means to be human, activities that aren’t essential to survival are central to that. Those living in dismal hardship will often sacrifice money which could be used on food for a little pleasure. We live in a world where troops on the front line in WW1 could stage a football match with their adversaries, after all. Fiction enhances its plausibility by recognising this impulse: Metro 2033 gave us a world at humanity’s darkest conceivable juncture, but still has room for music and sociability. 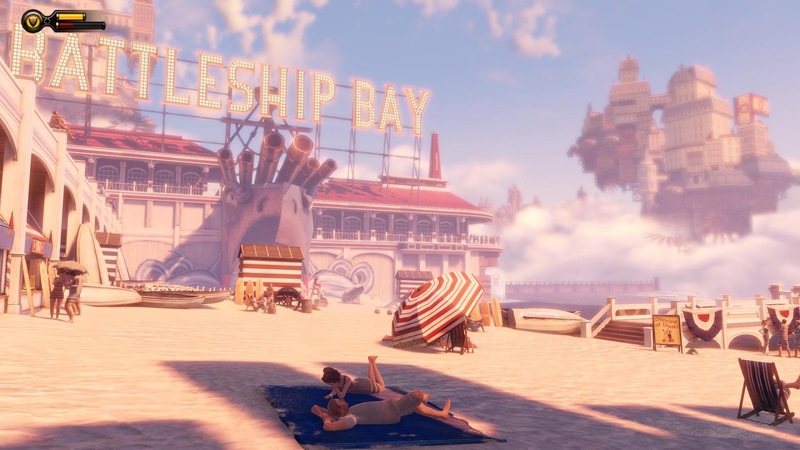 Bioshock Infinite hints at these tendencies, even tries to redeem its protagonist and itself in the process, but it’s primarily about what it means to have once been human, then contorted into the shell of a videogame character. Which just makes it even more heartbreaking when, amongst all the carnage, Booker and Elizabeth share a rare moment of touching human communication, revealing what could have been. And then the gunfire resumes. Francisco Dominguez is an English graduate currently pursuing a postgraduate career in stacking food. You can follow him on Twitter. At first, I thought I would hate this article. I saw the title and I immediately thought “Oh no, another article beating on my beloved Elizabeth”. But after reading the article, I realize not only do I not hate it, but I completely agree with it. It makes me realize how much I just want to be with Elizabeth, without using Booker as a surrogate who can only kill people and eat lots of food. Now I understand what you meant by “Elizabeth ruined Bioshock Infinite”. I agree, she made the game too good to be just a game. Second-person narratives are a possible P.O.V. for a story, though you’ll only find them in literature and not film. This is an understandable reaction to it and one that has been documented in hundreds of cases against use of that P.O.V., but it has its place in Faulker short stories and Bright Lights, Big City to create precisely this disconnect, this tussle for control, between player and avatar. At some point, you have to realize that you weren’t prepared to read/play a second-person story to begin with — and that’s *fine. * However, you can store that complaint in the same box with complaints about audio logs: audio logs are, first and foremost, monologues, and if you can’t stomach monologues (which is a big part of why few people go to plays anymore), then you’ll vomit at it, call it “immersion breaking”, and watch a film instead. Constraints such as second person offer benefits much like audio logs do, but they’re constantly ignored for being “outside the norm” and the obvious drawbacks are emphasized above the hidden pluses. At some point, you have to roll with someone’s decision to do away with a mute or bland protagonist (which Metro 2033 had) and embrace its problems. This is both needlessly belittling and normalizes problems as necessary idiosyncrasies, outweighed by “hidden pluses” no less. I don’t suppose you expect us to be wooed by “This is the way it has to be, and it has its benefits, trust me on that”. And I find it weird to claim that monologues are what drives people from theatres, when formats predicated on the same audience relationship, but presenting different content in other venues are flourishing everywhere, from Vlogs to Let’s Plays, and basically any other internet video phenomenon that involves people talking directly into cameras. But then you’ve lost me when you suggested people who dislike audio logs would prefer films anyway. Because these involve less being talked at? I’ll concede that I could have worded my statement about the author not being prepared to read a second-person narrative a little better. You’re right: it’s belittling to the author in a way that’s unacceptable in hindsight. On the other end of it, though, I don’t think that normalcy exists in the world of artistic decisions in the way you’ve put it forward. Idiosyncrasies and problems can be identical or veer from one category to the other depending on how the viewer tolerates them. Vlogs and Let’s Plays are charged with problems due to the nature of the form they put forward in the same way that theaters/monologues are charged with breaking scene or stopping momentum. Are you claiming that Third-Person Shooters or First-Person Shooters have “idiosyncrasies” whereas what we have here has “problems?” I’d find that the ubiquitous lousing about silent protagonists means that there are genuine drawbacks to First-Person Shooters which are made in exchange for genuine benefits. I wouldn’t say that choices such as second person are *outweighed* by hidden pluses so much as *accompanied* by them. In regards to the article, I do think that the author was so “turned off” by the negatives so as to disregard the positives of the form. This doesn’t mean that his problems with it don’t exist so much as I believe he didn’t assess what they did for the narrative or other parts of the game. I’m seeing (or maybe imagining) a lack of holistic thinking here and in some of the other articles while I’m also sympathetic to their origin. In other words, I don’t think the author is wrong, but he’s missing some context or deciding not to place it in a certain context. As to the very comparison you make between Vlogs/Let’s Plays and monologues, I think you’re engaging in some reductionist reasoning. Monologues/musical numbers are different from Vlogs/Let’s Plays in their inclusion or break-up of scene, which is a movement through an event in real-time instead of synopsis, and Vlogs/Let’s Plays don’t usually exist in a vacuum like Fink’s audio logs about the Fink Hammer (which supply a dramatic need as per a monologue’s intent), but summon up a Greek chorus in the form of video content or paste-ins for stichomythia. Even if we were to solely admit the (marvelously entertaining) Francis videos sans visual or audio stichomythia as evidence of modern monologue, we’d find that they lack the surrounding scene to supply a dramatic need. You’re saying that the scene preceding or succeeding a monologue isn’t necessary for the verbal script to be a monologue; I’m saying it is. To take Shylock’s monologue from the Merchant of Venice, for example, and remove the play or character around it would make it a speech or commentary, not a monologue. Though I do find the idea that Obama’s Inaugural Address is more of an Inaugural Monologue both amusing and appealing. To bring it back to the game, I think that we’re judging a Second-Person Shooter by the drawbacks and “hidden pluses” of a First-Person Shooter. Our constant clash with Booker’s personality gives him definition, something which the protagonists of First-Person Shooters singularly lack as ciphers. As for your question as to my judgment on flagging interest in theater or musicals, I ask whether or not you’ve heard complaints about characters spontaneously “bursting out into song” or talking to the camera. If you haven’t, then I’m glad to direct you to people who voice such complaints. They are legion. Their complaint isn’t the sole reason why theater has been deserted, yet it’s a big one. Their complaint is also not wrong. In sum, I think the above article is a well-written, emotionally valid piece on second person that nevertheless passes over the service it performs here. You’re correct that I didn’t explain this well in that first comment. I’m hoping I did a better job here, even if I delved into too many “I think” and “I believe” statements for my comfort. I certainly think we’re getting somewhere, though I’m still not sure what to make of it, or the complaints you lay before me. A lack of holistic thought is a serious issue, but also such a wide and far-reaching complaint that I can’t do much more than shrug and smile apologetically. I do take any comments seriously, even when I get argumentative in responding. It’s less that I feel one form is plagued by problems and the other simply comes with certain inherent anomalies, but that it seemed you were making that distinction. As far as I can tell, you are arguing that Infinite is supposed to make us feel this friction between player and protagonist (second-person is not a well-defined term in relation to videogames, and not very helpful outside of quoting other media). You’re right to note my reasoning was reductionist, though the bigger problem is that I read your complaint along a ludologist angle (too many words in my videogame). Beyond that, it’s mostly me responding to your own lack of context comparing audiologs to monologues (which are different to Let’s Plays in breaking up the scene, but not to audiologs, etc.) in order to include an aside about theater. It’s not nice to read this as an attempt to show of your knowledge of greek drama and literature. On the other hand, none of the examples or fancy terms were really necessary or helpful in making your argument clearer. I don’t doubt these complaints exist, and you’re making a lot of good observations about narrative devices, but at this point you’re also beating context into what appears an afterthought in the first comment. This is where the editor in me speaks. This is going to be long because it’s fundamentally tangled and a comment in place of an article. It’ll break out dreaded existential clauses and weak verbs because my interest keeps me here and not my wallet. And ludics shouldn’t feel ashamed at appropriating dramaturgy. It’s how we construct narratives, after all. How else would we do it? We use the words “protagonist,” “antagonist,” “central conflict,” “theme,” and so forth. Films are more than their cinematography. Games are more than effects on their ludic parts (and yes, “ludology” is smashing Greek and Latin together). We’re so intent on constructing ludos that we’re forgetting logos. Every media has logos, yet we think in terms of “too many words in our videogame.” Everything that discounts ludos is seen as a detriment despite how it might aid the logos. That’s a failure in holistic thought. That’s not considering the whole. As a side note, you might want to discourage Mr. Dominguez from actually reading Greek (particularly Euripedes). Alcestis, Amphitryon, and Medea are three plays that come to mind and star irredeemably violent assholes. In that light, I’ll table the whole “is its violence meaningful” brouhaha because that’s become more of a discussion on the state of the industry and less of a discussion on whether or not Booker’s character fits here and in this setting. If you’re asking for my opinion, I think that the violence should have been punctuated instead of protracted, that it’s an understandable concession to gameplay that I personally find enjoyable, and that Peckinpah captured equivalent levels of more realistic violence without sacrificing his status as a cinematic master. Shooters are like westerns to me. They’ll probably recede soon and stick around in some form or another. Infinite is second person precisely because a familiar effect the above author experienced exists. The player is not Booker even if he’s placed behind his eyeballs: the player is Booker’s captive as Booker asks men and women where that young lass in a blue dress went; the player is Booker’s captive as to whether or not he can free labor agitators from their stocks; the player is Booker’s captive with regard to a Peckinpah-esque diplomacy (those who complain about the game’s violence would do well to remember the classic western, of which Infinite is a twisted shadow in a lot of ways — references to Wounded Knee are not blasé); the player is Booker’s captive as to the ways in which he interacts with Elizabeth; most importantly, the player’s morality is captive to Booker’s. Between the player and Booker lies an intentional disconnect, a gut-churning sensation wherein we pick the character apart and put him back together and reject a lot of what we see. Furthermore, Booker’s “narration” isn’t the cipher-type, but the imperative “go here and do this” type dictated by who he is. The immediate result is a more crafted character in Booker. He’s not a man who dances. He fits his environment despite the fact that you hijack his legs because it reacts to *him* and not you. So the trade-off in play here is simultaneously characterization and a greater control over the narrative. I’m also aware that I need to prove that the positives and negatives of Booker’s narrative match second person as we know it. I’ll cull certain parts to make my point, but a few links will provide further detail. First-Person Shooters put one in the story through ciphers. You’re invited into the mind of the narrator because you become the narrator. Blank slates are a necessary part of creating full first person. It’s why Master Chief is pretty much a blank slate despite piss-poor attempts to flesh him out. In any event, the effects of a cipher are the same as reading first person: you can’t get closer to the narrator or to the events of a story than the first person. It’s also true that you can’t get a better “objective view” or full picture of the character than third person, which I predict will become (if it hasn’t already) the de facto point of view for games much like third person is the de facto point of view for stories. It allows us to view the character as an object. Second person neither moves us as close to the character as first person nor allows us to regard a character like third person. It also comes with significant problems identical to the ones brought up here. “You first met him in the Harbour Lights Hotel on Christmas Eve. It was also the day you turned forty. He was standing at the bar, digging in the right hand pocket of his chinos for change. You watched him from a dark booth as you sipped your third vodka martini. This is precisely the problem you’re expressing. The dilemma with second person is that you’re co-habiting the same narrative space. Just like you are with Booker. The problem I have is that this understandable rift is seen as a thoroughbred mistake and not a clue to something greater. It’s an excuse to stop. The hands fly up. “Teacher, I found an error! May I leave now?” Bodies file out of the classroom. Discussion over. If I sound a tad condescending, it’s because I’m partially reacting out of self-disgust. I’ve done this to my fiction workshop classmates. I’ve shot down dozens of second-person stories, many of which weren’t nearly as compelling as Infinite’s. In retrospect, I don’t think my overall negative judgment was misplaced, but my work ethic certainly was. If you pick up a how-to book on fiction (or a professor on the same), you’ll get a Manichean print of DO NOT USE under the heading of second person followed by a crack against Choose Your Own Adventure. Everyone’s a raconteur. Rules can be broken if you know what you’re doing. 1) Second-person narrative successfully emphasizes author lack of being a full, mature “subject” capable of first-person story making. 2) the “you” sets the author/narrator apart, an object, not in control of this his own narrative. 3) Mere clumsiness or lack of authorial skill may be perfectly appropriate to the narrator and the situation. 4) Awkwardness and confusion of the language heightened nightmarish qualities. In particular, numbers two and five are germane to our discussion and the rest are specific to a passage. “The most familiar use of the second person, for those of us who grew up in the 80s, is the Choose Your Own Adventure series. In those books, the second person really is an invitation to readers to imagine these events happening to them. This works because the Choose Your Own Adventure books don’t characterize their protagonists. The whole point is for kids to imagine themselves experiencing an adventure. That is not the case with Bright Lights, Big City. McInerney’s narrator is characterized in detail. I know what clothes he likes (and they aren’t the same clothes I like). He spends most of the book seeking or snorting cocaine (and I’ve never tried cocaine). He’s younger than I am, he’s more emotionally frayed than I am, he works a job I’ve never had. I understand the ambivalence he feels toward Tad Allagash, even though I am not ambivalent: I loathe the guy. So the narrator is not a blank on which I am supposed to project myself. And the choice of the second person is distancing, at least relative to the first or limited-third person. Why is it, in this case, so powerful? Yes! The second person is powerful because it is impersonal and removed. It is a pattern of speech characteristic of people who are in the process of struggling (and as yet failing) to digest, to accept “all the bad, traumatic, unfortunate experiences in their lives.” As I get deeper into Bright Lights, Big City, the choice of the second person starts to read less like youthful flamboyance from McInerney and more like a coping mechanism of the narrator’s. Long before we start to understand just what bad, traumatic, unfortunate experiences have messed up our narrator, we start to develop the visceral, dreadful sense that he’s in real pain. That’s the second person in action. Starting to sound a little bit like Booker? “Bright Lights, Big City” has a sociopath of a different kind, but it’s a sociopath. The “you” sets the narrator/author and protagonist apart and makes the protagonist not entirely in control of his actions. Much like a certain Pinkerton picking out number 77 despite the fact that he was forewarned, refraining from covering up A.D. on his hand despite being told that it’s bad, bad news, and shooting countless men and women because he feels that he has no other way out. Not to mention the fact that the twist makes Columbia quite a different place for Booker. Many don’t follow the twist through to its logical conclusion: everything that Comstock has made a virtue in his twisted utopian fantasyland is a symbol of shame and deeply personal for him because he’s the same man as the utopian. Functionally, Columbia is Booker’s personal hell. That’s why this feeling Dominguez gets is important. It shows you how he’s scarred instead of telling you. 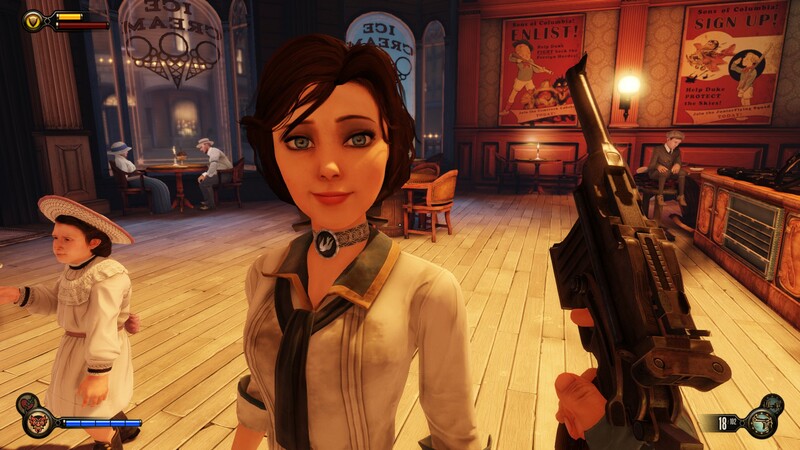 Elizabeth serves as a co-protagonist and foil for Booker while also functioning as a reflection of Booker’s hell and denial. In order to make this all work, you have to entertain a co-habitation. Booker doesn’t dance. You don’t dance. P.S. Booker doesn’t cover up his hand/look for more pacifist solutions/forgo number 77 because the story has a lot to do with determinism and fate as well. If you notice them, that’s because they were there for you to notice and point toward something else. Audience engagement is necessary for a good story as well. That’s where accusations of “spoonfeeding” a plot come from: a lack of audience engagement or interpretation. At the same time, it’s not *necessarily* a fatalist interpretation of determinism because it doesn’t deprive our actions of meaning, just complete agency. It’s compatibilist in nature — something which can encourage either fatalism or optimism. It even underscores this point by crafting observations by the Luteces, who are essentially godheads, about this dichotomy. Nobody’s kept here by their wallets, so I’ll leave it at that. This is fascinating stuff, and you’ve certainly covered your bases when it comes to terminology, and then some, but it’s nice to finally see a bit of the interpretation behind this shine through.